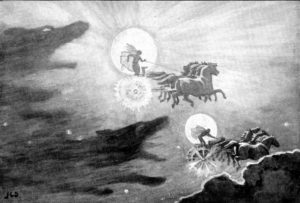 Norse mythology is the body of mythology practised in Scandinavia (Norway, Sweden and Denmark) stemming from paganism and continuing after the introduction of Christianity. Norse mythology encompasses figures and stories from numerous sources, medieval manuscripts, archaeological evidence and folk tradition, from before and after the pagan era. Some of these deities include Thor, Odin, Freyja, Skaoi, Njoror and Loki. This religion was animistic (the attribution of a soul to flora, fauna and inanimate objects), polytheistic (the worship of multiple Gods), pantheistic (the universe is a manifestation of the deities) and held a cyclical view of time. Like many other early religions, the mythology has very clear myths about the creation of the universe and humanity as well as having divine explanations for day and night, weather and natural phenomenon. Most of the surviving mythology we know of today centres around the plight of the gods and the tales surrounding their world. Norse mythology consists of nine worlds that all surround a central cosmological tree, Yggdrasil. All beings inhabit these nine circles- the Gods reside in the heavenly realm of Asgard, humanity inhabits Midgard, and the other worlds are inhabited by beings such as elves, giants and dwarves. Travel between the worlds was very common in myths and legends, where Gods, humans and other beings would interact directly. Humanity was created from the flesh of Ymir, a primordial being and the first two humans Ask and Embla were born. Norse mythology has similar themes of an apocalyptic end, the world will be supposedly reborn after Ragnarok, a battle between the Gods and their enemies, in which the world will be enveloped in flames and then born anew, fertile and green and once again two humans can repopulate the earth. Elements of the cosmos were personified like many other ancient cultures, the Sun was Sol, a Goddess, the Moon was Mani a God and the earth was Joro another goddess. Units of time were personified in the Viking’s deities, Dagr and Nott, day and night respectfully. Norse mythology is recorded in dialects of Old Norse, a North Germanic language, spoken during the European Middle Ages. These texts were recorded in manuscripts from oral tradition in Iceland during the thirteenth century. Poems and Sagas have given the best insight of beliefs and deities worshipped amongst the Norse people. Objects from archaeological finds have been interpreted as depicting Norse mythology, such as amulets with Thor’s hammer found amongst pagan burial sites, and small female figures interpreted as Valkyries. Evidence collected in records, place names and manuscripts have led historians to concur that Thor was the most popular deity amongst the Vikings. Thor is portrayed as a valiant defender of humanity with his hammer Mjolnir, and laying waste to jotnar who are foes of the gods and humanity. Loki is the trickster God, often referred to as a shapeshifter, who is responsible for conflict and turmoil amongst the Gods and humanity. Odin is frequently mentioned in surviving texts, portrayed as one eyed with a wolf and a raven flanking him, he pursues knowledge throughout the worlds. In a selfless act, Odin hangs himself on Yggdrasil to gain knowledge of the runic alphabet, which he then passed on to humanity. Odin is also the ruler of Valhalla, the Viking comparison of heaven and thus he is often associated with death. Valhalla, a majestic and enormous hall in Asgard was the afterlife for the warriors who had died in combat, where one would clash in battle all day and then spends your nights feasting, celebrating and participating in general debauchery. Warriors in Norse culture were held in very high regard. 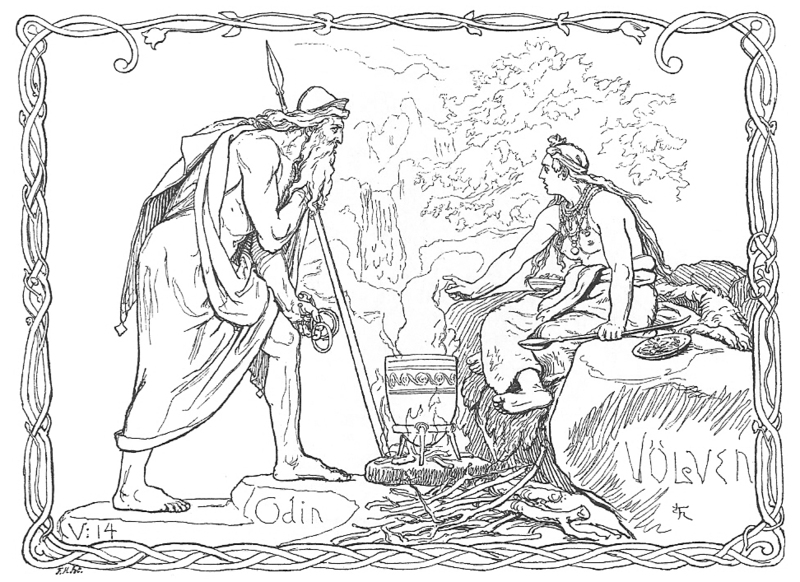 Other gods include Odin’s wife, Frigg who is omniscient, and Freyja who shares half of the dead with Odin and brings the deceased to her afterlife field of Folkvangr. The God, Njoror is associated with ships and seafaring as well as wealth and prosperity, he is in love with Skaoi, the mountain goddess of hunting and skiing, though the love is ill-fated as neither can be away from their homes of the sea and mountains respectively. The Norse afterlife has various destinations for the dead. Hel, a murky realm ruled over by a Goddess with the same name. As mentioned above, Valhalla and Folkyangr were other destinations for those slain in battle. The goddess Ran claimed those who died at sea, and the Goddess Gefjon ferried virgins upon their death. On top of all of these different ends a soul may meet, reincarnation is frequently referenced in texts describing myths and Norse mythology. 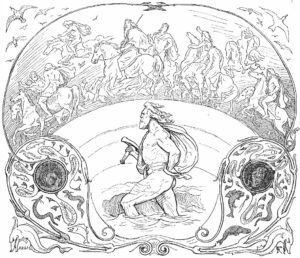 Norse Mythology is a complex belief system with numerous deities and potential afterlives, but the stories and beliefs offer great insight into the Norse people. The mythology depicts a warrior and naval-based culture, concerned with honour through battle and soldiers with little fear of dying.